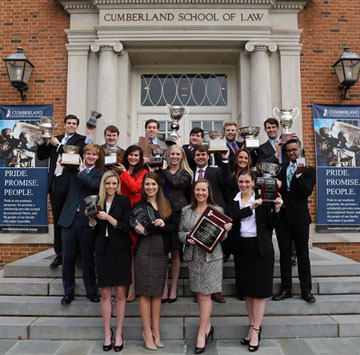 Photo: 2014 advocacy team members pose with a few trophies won around the nation by past Cumberland School of Law teams. Samford University's Cumberland School of Law is once again ranked among the top 10 in "U.S. News and World Report's" 2014 list of schools with the best programs in trial advocacy training. Cumberland tied for sixth place in the category. In trial advocacy courses, students argue cases before mock judges and juries, and may compete in national or regional mock trial competitions. The U.S. News ranking is based on a survey of faculty from law schools nationwide. "Our high national ranking in trial advocacy is a testament to the hard work of the faculty and staff who teach and work in our trial advocacy program and our students and their coaches who have had exceptional success in national competitions," said Cumberland dean Judge John L. Carroll. "Cumberland school of Law prides itself on producing lawyers who are ready to practice." From the first year evidence course through the capstone advanced trials skills course incorporating the latest courtroom technology, Cumberland teaches students every aspect of trial law, said Deborah Young, director of Cumberland's Center for Advocacy and Clinical Education. "We are delighted that Cumberland's exceptional Trial Advocacy Program has once again received this national recognition," said Young. "We thank the many judges, attorneys and alumni who support our outstanding trial advocacy students." The Cumberland program is regularly included in U.S News rankings and its student teams consistently receive regional and national recognition for outstanding performance and professionalism. Cumberland student trial teams continued their history of national championships in trial advocacy by winning first place at the National Civil Trial Competition in Los Angeles, Calif., in November.